Preparations are in the works for ringing in the New Year—2018! 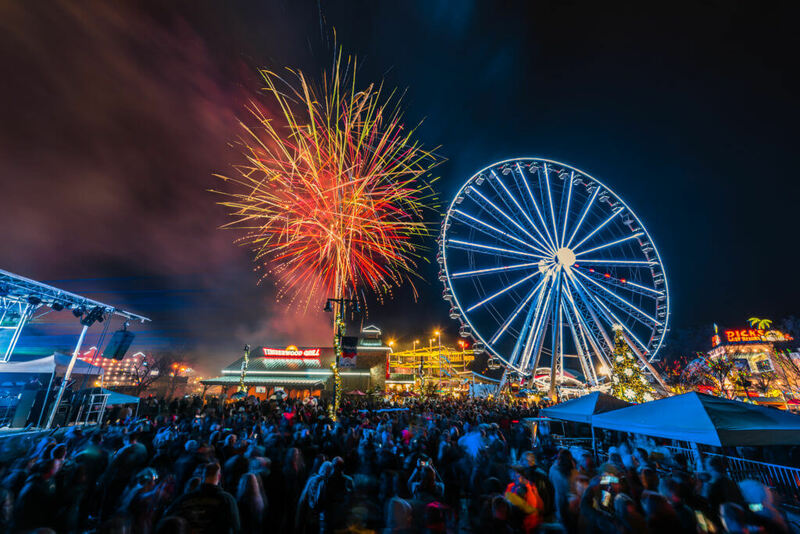 Both Gatlinburg and Pigeon Forge have plans on their calendar for their celebrations, including fireworks. If you’re ready to secure your spot at one of the most beautiful shows of the season, check out our list of ways to celebrate the 2018 New Year in the Smokies. Plan to arrive early to get the best viewing location for the fireworks. At the intersection of Parkway and Historic Nature Trail, you’ll find the source of all the excitement—the 400-foot tall Space Needle, which has been hosting the ball drop since 1987. This year’s show is poised to amaze with fireworks starting at midnight, produced by Pyro Shows of LaFollette, TN, and rhythmic LED lights to go along with music. If you’re looking for a place stay to watch the ball drop, check in at Quality Inn Creekside Hotel, The Park Vista, or Riverside Motor Lodge. This year’s annual event will feature headliner RaeLynn, presented by Q100 Country. She was named one of 2017’s Artists to Watch on Pandora. The event is free and family-friendly (with games and a chance to win prizes), so make sure you add it to your calendar! Festivities start at 8 p.m. with RaeLynn going on stage at 11 p.m. If you want to stick around for the fantastic fireworks and countdown to New Year’s, they will start at midnight. Bring in the New Year while being dazzled and amazed with laser lights and pyrotechnics. This unique show starts with the “Christmas at the Smoky Mountain Opry” at 9 p.m. on December 31, 2017, and concludes with a live feed of the ball drop in New York City’s Times Square. Afterward, you can see the cast up-close-and-personal in a meet-and-greet session and dance on the Opry stage with the live show band. Call 1 (800) 908-9018 to see if seats are still available. Don’t leave out your kids! The Titanic Museum Attraction has an extraordinary event for kids on Sunday, December 31, 2017. The “Noon” Year’s Eve event allows kids to ring-in the New Year early with a midday bash, a visit from Alice in Wonderland and the Mad Hatter, and a balloon drop. Call 1 (800) 381-7670 to book. Are you looking for something a bit more low-key? Dollywood’s DreamMore Resort & Spa is offering three New Year’s Celebration Packages, which include access to their Midnight Dance Party and a toast at midnight. Packages range from $10–$55.95 for adults and $5–$25.95 for children ages 4–9. Keep MobileBrochure.com on your bookmarks list for 2018 and stay close to all the latest Smoky Mountain news and events! Absolutely LOOOVVVEE the smokes /pigeon forge , got married at the old mill waterfall 2015,..